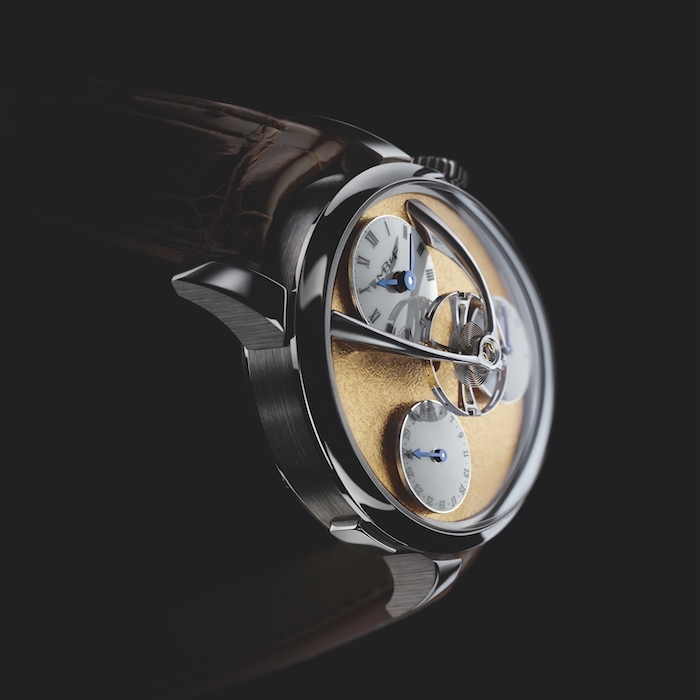 The MB&F Legacy Machine Split Escapement is the latest creation by Maximilian Busser and his Irish friend Stephen McDonnell. 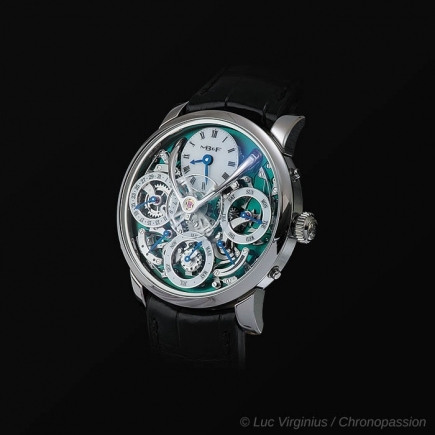 Both had already collaborated on the previous and most complicated of all Legacy Machine watches, the Legacy Machine Perpetual. For this new creation, the fifth in the Legacy Machine collection, the main feature of the watch, its over-sized 14mm balance wheel, remains positioned centre stage, floating above all other elements of the dial and nicely tucked right under the domed sapphire glass. Throughout the Legacy Machine collection, functions and complications vary but the suspended balance wheel remains a constant as it flies literally and metaphorically above everything else. The new Legacy Machine Split Escapement can in a sense be seen as a re-imagination of the LM1, the first Legacy Machine. 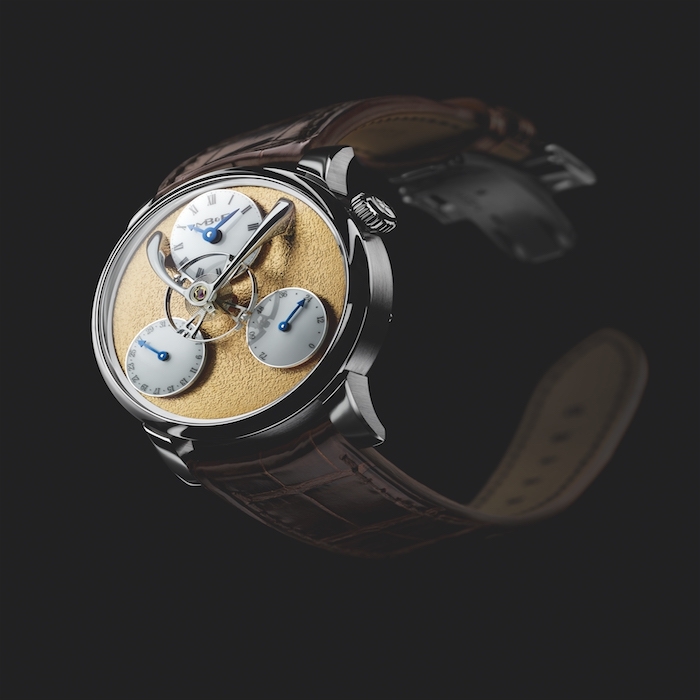 As most of the machines bearing an MB&F signature, the Legacy Machine Split Escapement presents a unique architecture and a new, contemporary interpretation of time. 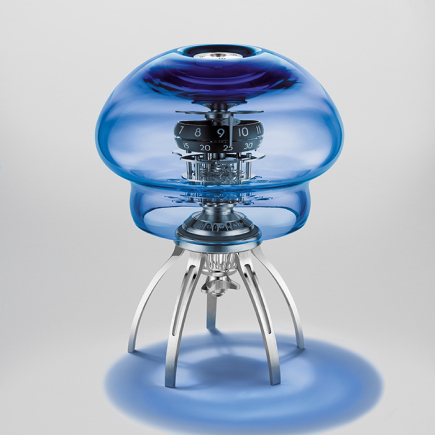 MB&F watches display time in an audacious, futuristic and creative way. 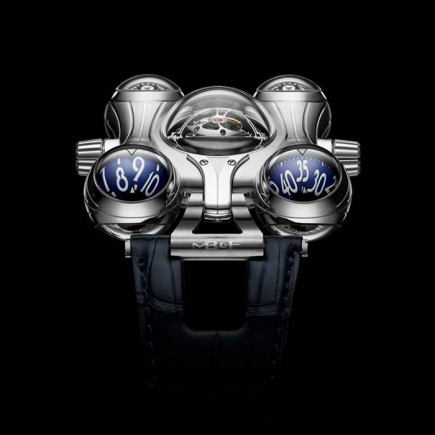 But MB&F watches, and in particular the watches from the Legacy Machine collection, demonstrate that time can be constructed in many different ways. 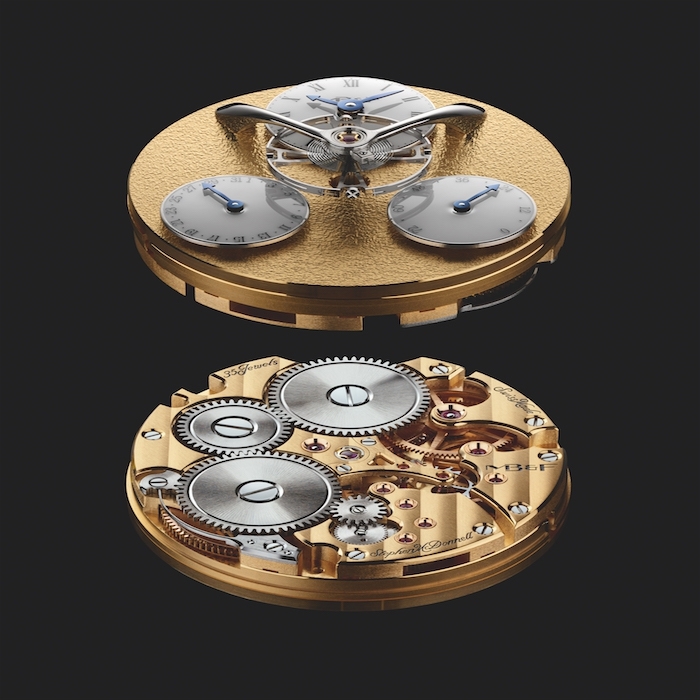 Stephen McDonnell had already shown with the Legacy Machine Perpetual that 150 years old complications could still evolve and be built differently. 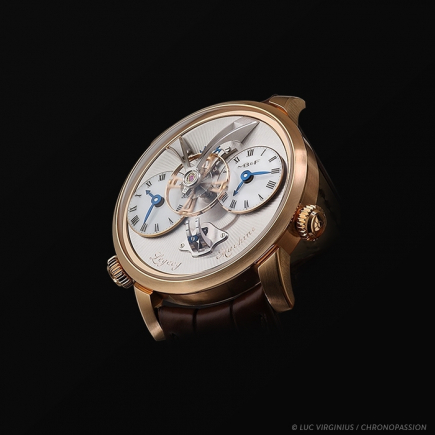 With the Legacy Machine Split Escapement, the independent Irish watchmaker proves again that fundamental mechanisms such as the escapement of a watch can still be reinterpreted whilst at the same time bring a real added value to the watch. As such, the escapement of the Legacy Machine Split Escapement is literally split in two parts. On the dial side of the watch, the oscillating balance wheel reigns supreme in the centre, flying above all other elements on the dial. On the reverse side of the watch, you can find the anchor and escapement wheel. The visual effect is impressive, as the balance seems to oscillate on its own, without any visible intake of energy. The essential remaining part of the escapement – anchor and escape wheel – are concealed on the opposite side of the movement, almost 12mm below. The movement of the MB&F Legacy Machine Split Escapement is not as complex as the one developed for the Legacy Machine Perpetual, but Maximilian Busser is coming back here to a more pure, sober expression of time, just as he had done with the LM1. The movement of the Legacy Machine Split Escapement beats at the slow, hypnotic rhythm of 2.5 Hz, right in front of you and at the tip of your fingers. 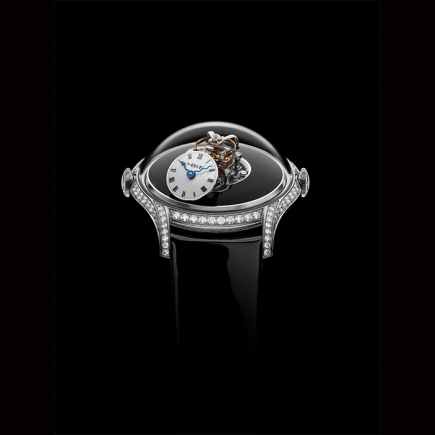 The domed sapphire glass magnifies the effect and plays with your senses. 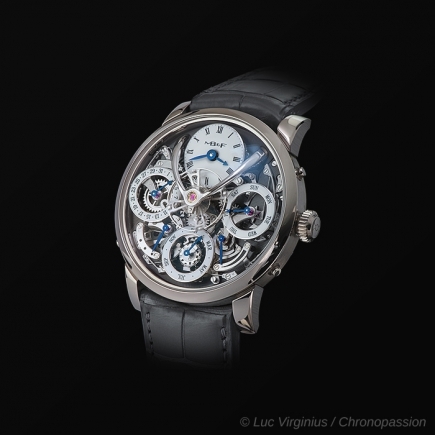 Under the balance wheel a first dial, positioned at 12 o’clock, gives the time with two blue hours and minutes hands. 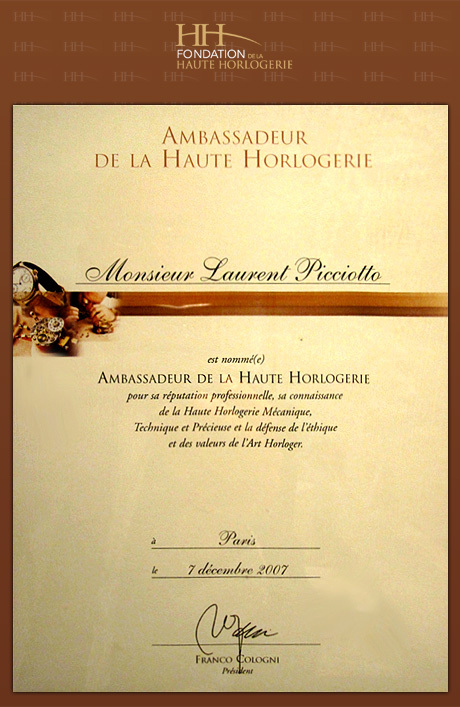 The 72 hours power reserve dial is positioned at 4 o’clock and indicated by a single blue hand. And finally the date dial sits at 8 o’clock, also indicated by a single blue hand. On the side of the 44mm, 18k white gold case, a push-button is located next to the date dial and enables a quick and easy adjustment of the date. The three sub-dials of the mbandf Legacy Machine Split Escapement are set against an effervescent backdrop of hand-frosted finishing – a rare and difficult traditional process, mastered by only a handful of artisans today. The texture of this backdrop is highly appealing and plays with the senses. The rugged appearance of the frost contrasts beautifully with the shiny white dials and blue hands. 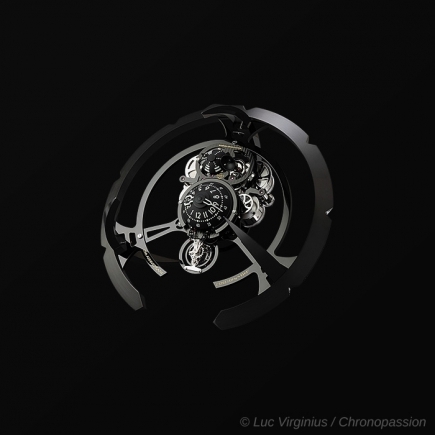 For the debut models of the Legacy Machine Split Escapement, case material options are limited to 18k white gold. 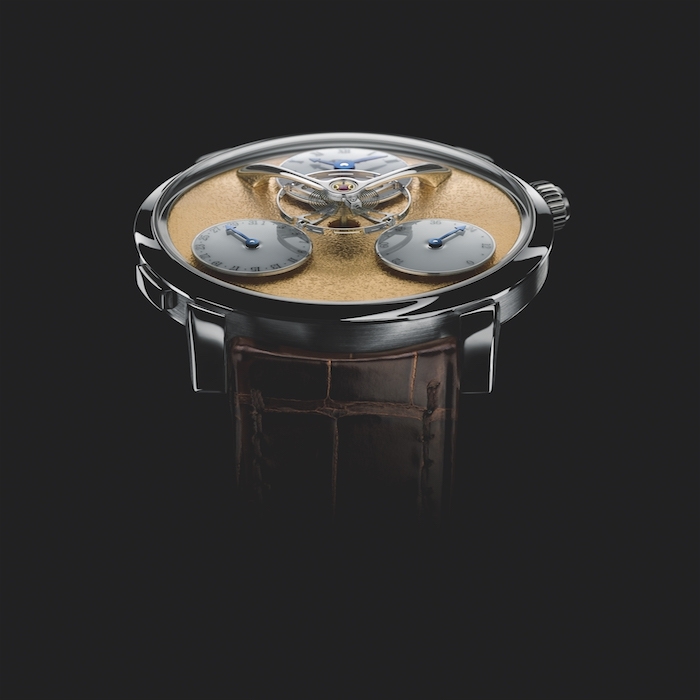 However, the frost dials come in four colours including yellow gold, red gold, blue or ruthenium. Each frosted dial watch variation comes in a limited edition of 18 pieces. But beyond the artisanal finish given to the frosted dial, it is just as important to also underline the superlative finishing of the movement on the reverse side of the watch. The finishing is 19th-century style, with bevelled internal angles, polished bevels, Geneva waves and hand-made engravings. 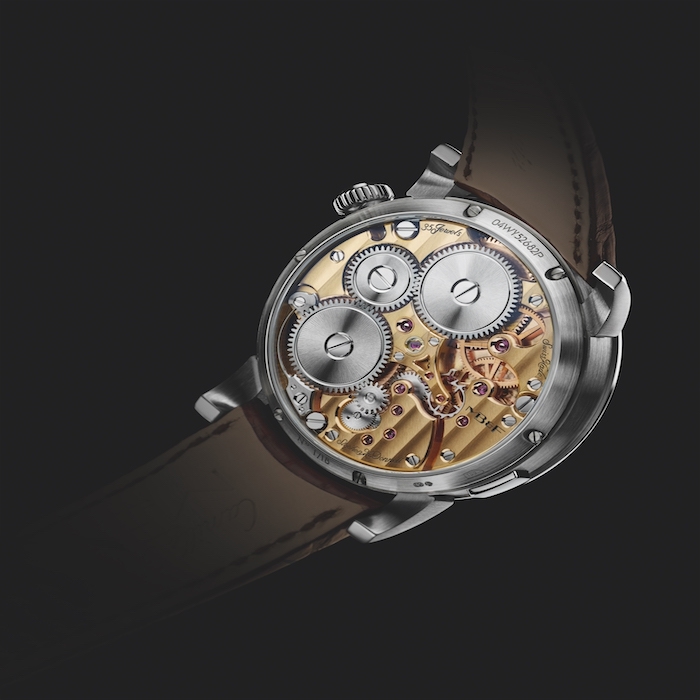 The large sapphire glass on the back of the case also enables to see the double mainspring barrels of this manually wound movement, capable of storing up to 72 hours of power. 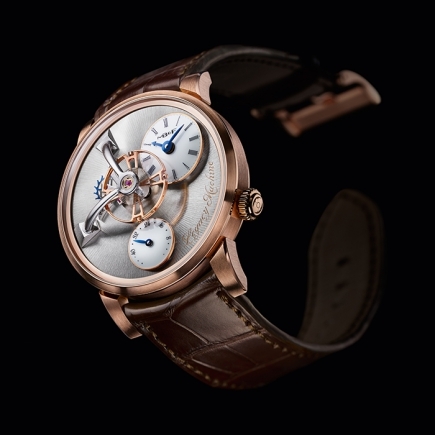 - Movement developed for MB&F by Stephen McDonnell. 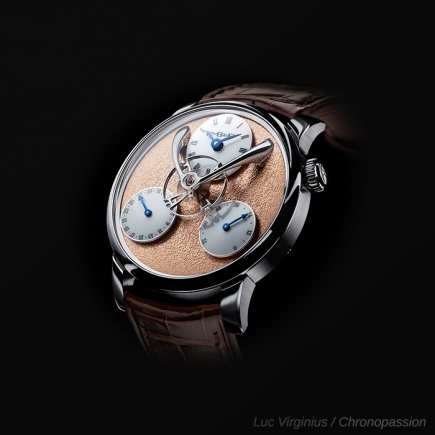 - Split escapement with the balance wheel suspended above the dial and the anchor under the movement. - Hand-made frost and engravings.